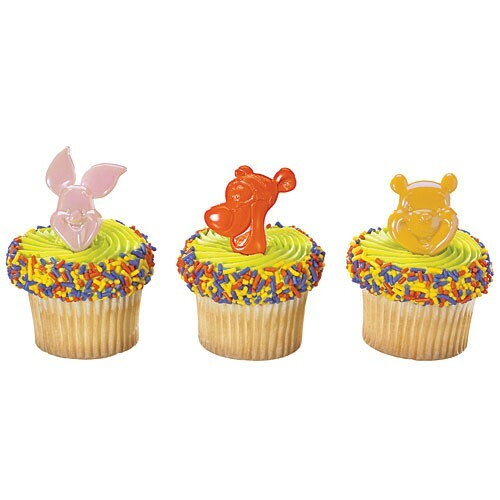 Winnie-the-Pooh and his pals are the life of any party and the lovable characters on these handy Winnie the Pooh themed cupcake rings will brighten your party treats with their happy, colorful smiles. These are plastic rings. Includes the characters of Pooh, Tigger, Piglet. Your guests will enjoy them on cupcakes. To make the event even more “Tigger-ific”, display the goodies on a Sweet White Cupcake Stand/Centerpiece. Rings are 2 3/4" tall and between 2” and 2 1/4" wide. *Only available as an assortment, not with a choice of individual characters.